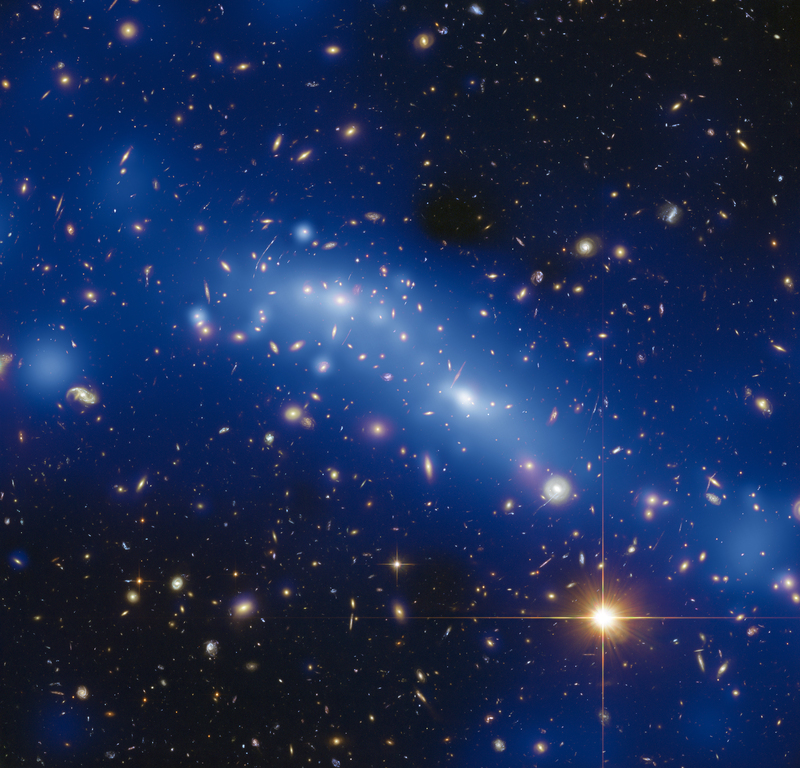 The Frontier Fields project’s examination of galaxy cluster MACS J0416.1-2403 has led to a precise map that shows both the amount and distribution of matter in the cluster. MACS J0416.1-2403 has 160 trillion times the mass of the Sun in an area over 650,000 light-years across. The mass maps have a two-fold purpose: they identify the location of mass in the galaxy clusters, and by doing so make it easier to characterize lensed background galaxies. Astronomers use the distortions of light caused by mass concentrations to pinpoint the distribution of mass within the cluster, including invisible dark matter. Weakly lensed background galaxies, visible in the outskirts of the cluster where less mass accumulates, may be stretched into slightly more elliptical shapes or transformed into smears of light. Strongly lensed galaxies, visible in the inner core of the cluster where greater concentrations of mass occur, can appear as sweeping arcs or rings, or even appear multiple times throughout the image. And as a dual benefit, as the clusters’ mass maps improve, it becomes easier to identify which galaxies are strongly lensed, and which galaxies are farther away. 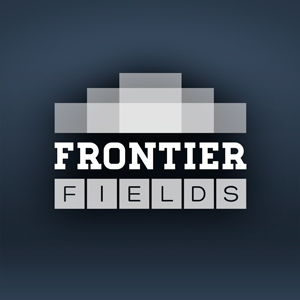 The depth of the Frontier Fields images allows astronomers to see extremely faint objects, including many more strongly lensed galaxies than seen in previous observations of the cluster. Hubble identified 51 new multiply imaged galaxies around this cluster, for instance, quadrupling the number found in previous surveys. 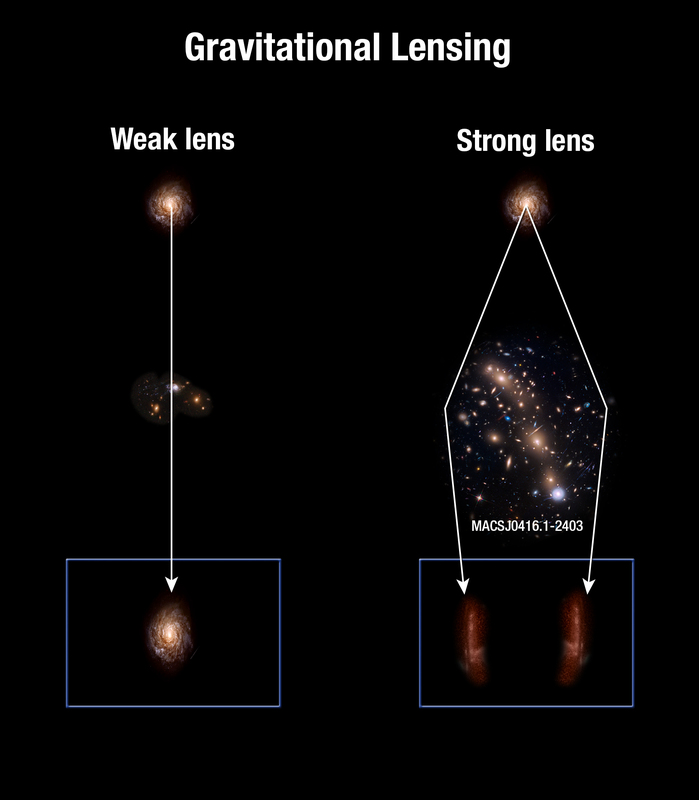 Because the galaxies are multiples, that means almost 200 strongly lensed images appear in the new observations, allowing astronomers to produce a highly constrained map of the cluster’s mass, inclusive of both visible and dark matter. The dark matter aspect is particularly intriguing. Because these types of Frontier Fields analyses create extremely precise maps of the locations of dark matter, they provide the potential for testing the nature of dark matter. Learning where dark matter concentrates in massive galaxy clusters can give clues to how it behaves and changes. And as the mass maps become more precise, astronomers are better able to determine the distance of the lensed galaxies. In order to obtain a complete picture of MACS J0416.1-2403’s mass, astronomers will also need to include weak lensing measurements. Follow up observations will include further Frontier Fields imaging, as well as X-ray measurements of hot gas and spectroscopic redshifts to break down the total mass distribution into dark matter, gas, and stars.